A Canadian playwright took to social media to search for the woman in a photo from a rock concert 40 years ago - and found her. 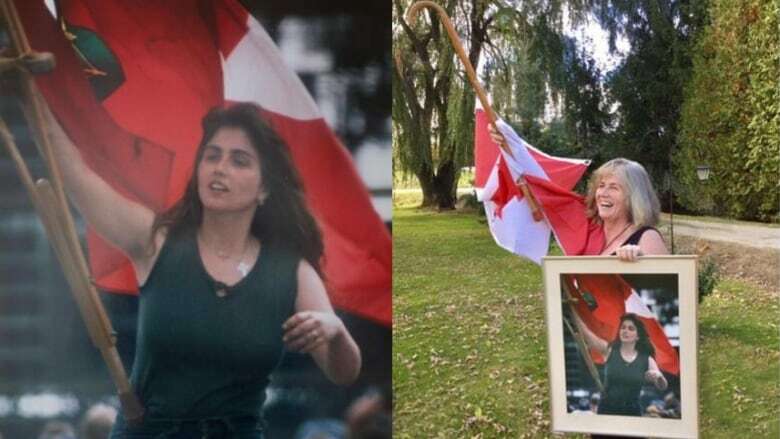 Noreen McCallum-Fedoriuk, first as a 22-year-old, then at 62, re-creating her photo. It's a photo that hung on Norm Foster's wall for decades. A young woman at a rock concert proudly holds up her Canadian flag, using a crutch as a flag pole. More recently, the framed photo taken by his friend at the concert they both attended in 1978 had been relegated to the back of a closet. But he pulled it out and felt the woman in the photo needed to see it. "I thought, it's a shame to have this sitting in a closet," he said in a phone interview from his home in Fredericton, N.B. "I thought I should give it to the woman if she's still alive and if she's not, let her family have it." Foster took to Facebook, hoping someone might know the patriotic mystery woman who attended the Canada Jam rock concert in August 1978. A few days later, in Meaford, Ontario, Noreen McCallum-Fedoriuk received an unusual message from an old friend who was in her Grade 7 class. Foster's Facebook message was there, with her friend asking: "Is this you?" "I said, 'Holy crap, that is me. I can't believe it,'" she told CBC Toronto..
"I was just beside myself." McCallum-Fedoriuk says she was 22 at the time. She still remembers seeing the band Triumph that day. The all-day outdoor festival at Mosport, a race track near Toronto, also featured the Commodores. McCallum-Fedoriuk had snuck in her crutch by hobbling past the gates, pretending she needed it, since sticks were banned. Once she was in, her "bad leg" suddenly healed. "I ran like hell," she laughed. All along, she'd planned to use the crutch to wave her flag. "I was rebellious, definitely rebellious. A party person," said the now-62-year-old. Now 40 years later, she emailed Foster to tell him his search was over. It was just four days after he'd first posted to Facebook. By that time, more than 4,000 people had shared his post. "I was amazed," Foster said. "It took four days to track her down, a woman I didn't even know from 40 years ago just by using social media." So he wrapped up the framed photo and sent it off in the mail. McCallum-Fedoriuk had a little fun when she received it, posing to recreate the old photo, this time using a cane, because she couldn't find her crutch. The photo now hangs in a corner in her living room. She says her husband likes it so much, he wants her to move it so it's front-and-centre when he's sitting in his favourite chair. Foster's friend, the photographer, had signed it all those years ago and named the photo Joan d'Arc du Canada, 1978. 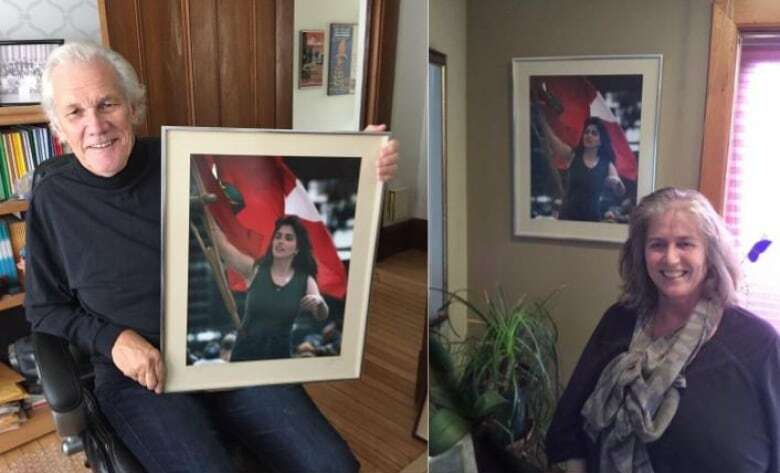 "His friends... are saying it's an [iconic] picture," said McCallum-Fedoriuk, though she doesn't really see that same meaning. "Me, it's just me partying." The two strangers decided to meet in person. A couple of weeks ago, Foster's latest play was showing in Ontario, so they met for coffee. Her initial doubts were put at ease. "You might think this guy might be a weirdo. Why did this guy have my picture for 40 years? It's kind of a weird thought." There was a deeper reason Foster wanted the photo taken by his long-time friend to be appreciated. He'd known Les Judson since elementary school, but he died years ago. "I just thought the photo should find the woman," Foster says. "Les's art would be worth something." Foster, who tells stories for a living, sees this as a good one that just might make it onto a stage one day. For McCallum-Fedoriuk, the whole experience has been a welcome piece of good news that's put a smile on her face. As for her, 40 years later? "I am still the same," she laughed. "I am still out there waving the flag and partyin' hardy as much as I can."